Editor’s Note: An estimated 10 million kids in the US have parents who are currently locked up, or who have previously been incarcerated. Those kids arguably suffer the worst consequences of mass incarceration. In 2014, a UC Irvine study found that having a parent behind bars can be more damaging to a kid’s well-being than divorce or even the death of a parent. Students with incarcerated mothers and fathers are more likely to receive suspensions in school, and are more likely to drop out than their peers. Kids with incarcerated parents are also more likely to come into contact with the justice system, themselves. According to report by the Vera Institute titled “Overlooked: Women and Jails in an Era of Reform,” nearly 80 percent of the women in jails are mothers. And most of those jailed mothers are single parents, solely responsible for their young children. 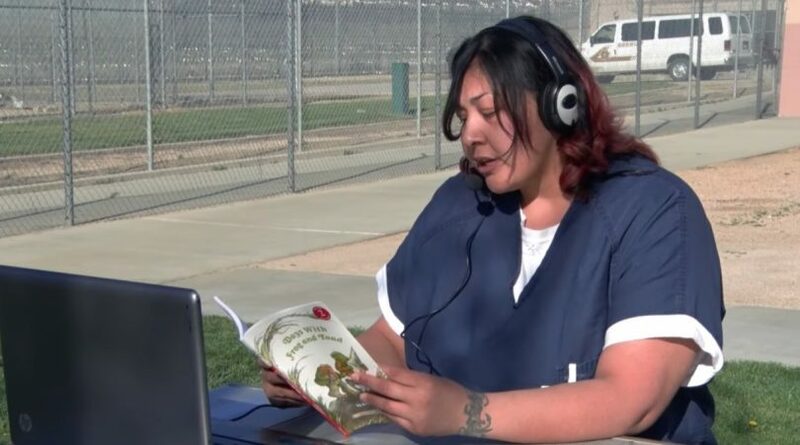 The CA Fwd story below tells of a San Bernardino County program working to mitigate some of the damage to families by keeping kids and their locked up mothers and fathers connected via recorded storytime sessions, that allow jailed parents to read to their kids. Two San Bernardino County departments are joining forces to help incarcerated parents better connect with their children through the simple but valuable act of reading books to them. Last month, volunteers from the San Bernardino County Public Defender’s Office volunteered time and donated items to the Parent and Child Connection (PACC), a program run by the Inmate Services Department of the San Bernardino County Sheriff’s Department. The PACC program gives incarcerated parents the opportunity to record themselves reading books to their children and include personal messages. The goal is to create a connection between the parent and child while reinforcing the importance of reading. Studies show that children who are not read to are at risk for poor language development and are less prepared for classroom learning. The donation from the Public Defender’s Office included three boxes of children’s books in English and Spanish. Additionally, volunteers from the department traveled to the Glen Helen Rehabilitation Center twice last month to assist incarcerated parents record books for more than 70 children. Neubert added that the Public Defender’s Office plans to continue donating and volunteering to the PACC program. They are working on expanding their participation in PACC by applying for a grant with the nonprofit, Place4Grace, which already has similar programs in 14 state prisons. PACC is one component of the Parental Intervention Program. It is offered at all four county detention centers, but mainly provided at the Glen Helen Detention Center and the High Desert Detention Center because of time and staff commitment. The Parent Intervention Program also conducts Trauma Recovery and Relations Classes to incarcerated parents, a program created by Dr. Laura Kamptner and Dr. Faith McClure from California State University San Bernardino. Once the parents complete the class, they may be able to participate in TALK (Teaching and Loving Kids), a program that allows children to visit their incarcerated parent under supervision in a school-like setting (participating in the class is not a prerequisite to involvement with PACC). Even though the parents don’t interact face to face with their children through PACC, it is still emotional for both the volunteers and the parents. “There were definitely tears, but there were lots of ‘Thank-you’s’ and it was really great for our staff to participate as well and just be around our client population and our clients’ families in a setting outside the courtroom to connect with them on that real human level,” said Neubert. This story, by Nadine Ono, was first published by the non-profit CA Fwd. Image by the San Bernardino Sheriff’s Department.